It’s almost officially summer, which means time to start prepping. Take the shorts and skirts out, book that beach vacation, and start packing. These are the essentials. But what we really mean though is that it’s finally time to get that BMW out of the garage. Especially if that BMW is an i-series! Drive or ship the BMW i-series? The BMW I series is the perfect combination of responsibility and adrenaline. And you can have it all if only you know how to take care of your car. We have to keep in mind that these innovative vehicles come with responsibility. You have to organize your trips well and plan your stops at charging stations. If you only recently bought your i-series gem, this might be quite the burden. Especially if you haven’t checked its computer system recently. A year-long investigation found some issues with the systems of several BMW’s models and the i-series is among them. So make sure you have someone check up your car. With this new information out, embarking on a long-distance journey might be a nightmare. Any journey beyond 200 miles is not worth the nerves you will go through. Even if there isn’t a real problem with the car, you will be constantly thinking about it. You’ll be stressed during the whole time wondering whether you’ll get your precious baby safely to your destination. Or you’ll end up having to buy another one. Shipping a BMW i Series. If you are an owner of an i-series model, you know how much it costs. Not only its financial cost but the emotional value attached to it. This is why your sports car requires extra care during transport. You need a reputable auto transporter that knows how to handle high-end vehicles. Luxury vehicles like these always require white glove service – from the moment you request a quote, to the final day of delivery and even afterward. Your BMW deserves the same amount of care and attention in transporting as it received in its production. This is why you need to choose a carrier with know-how and references to prove it. There is always a chance you come across someone with bad intentions. Even in auto transport, there are companies that simply want to take your money. Or more of your money. This is even more common with luxury car owners. Exactly because they value their cars even more. That’s why scammers aim at them. And when you don’t see the signs in their behavior early on, you end up the victim of a scam. Learn more about the companies you are researching. Always look at the company’s expertise. Does the company have any recorded cases of shipping a car similar to yours? Corsia Logistics has extensive experience in transporting luxury cars and sports cars. We recently shipped an Audi across the country, numerous Porshe models, a Ferrari, and even a Lamborghini. We had an opportunity to ship a BMW i8 series, too. Try to find opinions that prove the expertise. Everyone can brag about themselves. Yet, this might not always be a true reflection of reality. You need to look for an outside opinion, for example, past client reviews. Positive reviews will add an extra peace of mind that a transporter can handle your i8 or i3. At Corsia, we work for open and honest communication with our clients and we value their opinions. You can read about our clients’ experience and see their evaluation of our services in their own words. When you find the right carrier, have a talk with the representatives. They should give you an honest advice on what’s best for your car. Because of their high value, luxury vehicles require enclosed auto transport. This is because enclosed carriers provide the special protection high-value cars need. Such trailers shield cars from potentially damaging weather conditions or road debris. The higher protection, naturally, comes with a higher price. 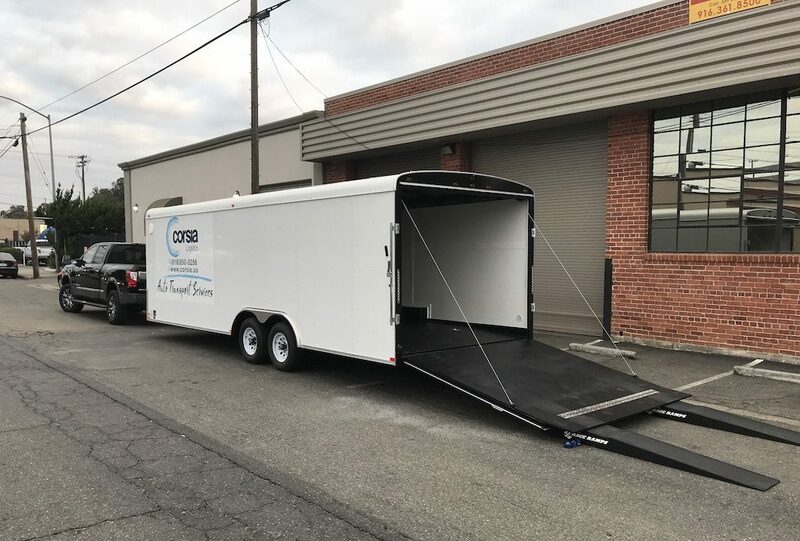 Enclosed auto transport is pricier because the trailers are harder to navigate and the driver needs more expertise to operate them. Moreover, the liability and cargo insurance a company pays for a covered auto transport truck is higher due to their high-end cargo. Thus, if you want to be protected, you have to contribute to cover these sums. Last but not least, there is only a small number of enclosed trailers in the country. Hence, they are mostly used for luxury, sports, and classic cars. The lack of supply also leads to the higher prices of the service. Just like the higher price of the i-series, the higher price of the enclosed auto transport pays off. With open auto transport, there is never full guarantee that there will be no scratches or marks on your car. Enclosed auto transport takes care of that. You can see how the process works in this video of Corsia shipping a Porsche. Get a shipping quote for your i-series car online or call (818) 850-5258. Schedule your shipment – set your first available pick-up date. Prepare your car for shipping – inside and out. Perform vehicle inspection at pick-up alongside the carrier. At delivery, perform inspection again, sign the Bill of Lading, and pay the remaining balance. Easy, right? It is always a pleasant experience when you have the right partner. So talk to our representatives and get a feel of our company. We are open to sharing all the information you need to feel comfortable with our service. After all, if you don’t see a BMW lover in front of you, how would you leave your car with the company? The BMW i series is considered BMW’s line of most innovative vehicles. The series is based on the idea of sustainable mobility, which adds to the efficiency and desirability of the cars. You will see the fans of the i-series ranging from eco-conscious drivers to high-speed and luxury lovers. Many people have said that the BMW i-series is just a poor attempt to get in the game of Electric vehicles. Disruptors like Tesla seem to be leading the category, while more and more conventional brands try to get a piece of that market. Yet, we all know that a BMW is never conventional. And the production of the i-series proves this once again. The greatness of the BMW i-series starts from the smarter manufacturing. The i-series are much lighter than other sports cars. This is primarily due to the use of carbon fiber in the passenger cell. The Carbon Fiber Reinforced Plastic (CFRP) is as strong as steel, but only half the weight. This is why it is often used in race cars. The creation of this innovative material takes place in the joint venture, SGL Automotive Carbon Fibers (SGL ACF) CF in the American Moses Lake and the Wackersdorf Innovation Park. The components are put together with a fully automated bonding technique that does not use screws, rivets, and welding. This guarantees the optimum strength to the bond. 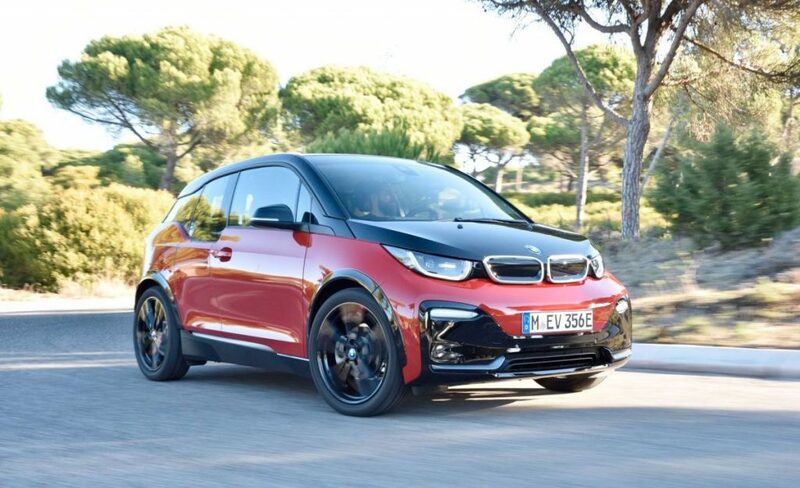 The materials and the joining process help for the reduction of the weight of it i3 and i8 series with nearly two-thirds of the weight of a conventional steel body. The i3 is an all-electric vehicle that operates with the environment in mind, which can be quite surprising for a sports car. Nevertheless, it seems like a good combination as the model is the 5th most sold EV car in Europe as per March 2018. The design of the model incorporates the concept for sustainability in all details, which makes it perfect for emission-free city driving. It is the first BMW ever made from plastic – only the roof is made from recycled CFRP. Moreover, 25 percent of the materials used for the thermoplastic outer parts are either recycled or made from renewable resources. Producing an i3, from first bolts to final inspection, takes 50% less energy and 70% less water. Here’s what we call efficiency! The BMW i3 impresses with its breath-taking acceleration and its high-voltage battery. It has a range of up to 160 km which makes it convenient both for urban driving and for trips in the catchment area of a metropolis. Well, it’s not a Tesla battery but it scores higher on rankings for projected reliability. And it powers a wind farm! After all, let’s not forget that BMW comes with a century-long prestige for luxury and speed, after all. Thanks to the smooth and quiet acceleration of the all-electric engine, the BMW i3 and i3s are among the fastest BMWs off the line. The i8 is a true representation of the sports car of the future. It’s a plug-in hybrid that brings together innovative technology with the environment in mind. It is the first sports car with the consumption and emission values of a compact car. Both the i8 Coupe and the Roadster amaze with sleek design and great performance. What we truly love are the scissor doors. Who wouldn’t! A top-notch element of any sports car. Yet, these are eco-friendly, too! If you are a true romantic, we recommend the i8 Roadster. It’s best for sunset rides down the San Francisco beach roads. It seems like the i8 is moving forward even when it’s standing still. What a beautiful illusion. The aerodynamic design makes it much more efficient than other sports models. The fast speed is guaranteed not only by the intelligent lightweight construction with carbon but also by its TwinPower Turbo engine, which adds additional horsepower. What is spectacular is that the interior of the i8 consists of recycled materials. Sustainability in the core. What more can we say? We love the BMW i series because with these cars you can really have it all. They let you enjoy the pleasure of driving by taking out the guilt of harming the environment. The production process of the i-series is truly worth getting to know. It’s what makes the cars what they are – a masterpiece of thought and design. And such a masterpiece needs to be taken care of. 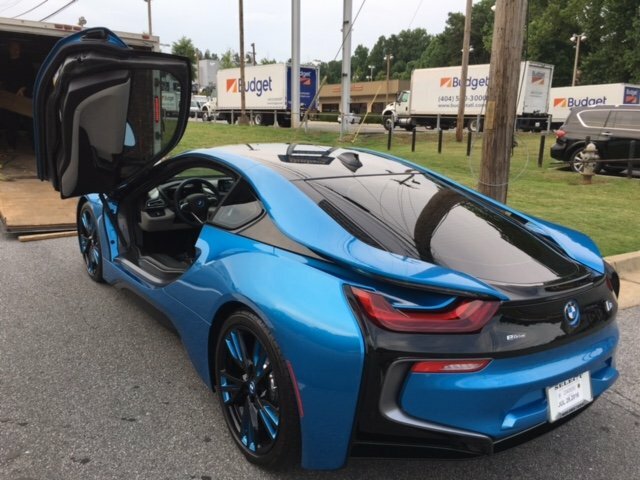 So remember to always look for what’s best for your i8 or i3 – both in terms of maintenance and in terms of auto transport.